Ghostbusters, which may as well be titled Whitebusters, is, apart from its white-washing which we'll discuss below, a near-perfect film. Deeply ingrained into our 1980s childhood, some lines - such as, There is no PPCC, there is only Zool! - are eminently quotable and appropriate for all occasions. Or, even better, Choose the form of the destructor! Set in the same bouncy, cynical, synthesizer-soaked 1980s urban landscape that the Enterprise crew found itself stumbling into once, a trio of paranormal aficionados are kicked out of Columbia University and their research grant terminated. While good ol' boy Ray (Dan Aykroyd) and nerdy Egon (Harold Ramis) are genuine in their interest in the paranormal, charlatan Pete Venckman (Bill Murray) is more interested in getting the girls and schmoozing with the crowds. His skepticism quickly evaporates, however, when the trio are called in by the New York Public Library to rid it of a spectral Victorian lady hovering through the stacks (and really messing up the Dewey index cards!). 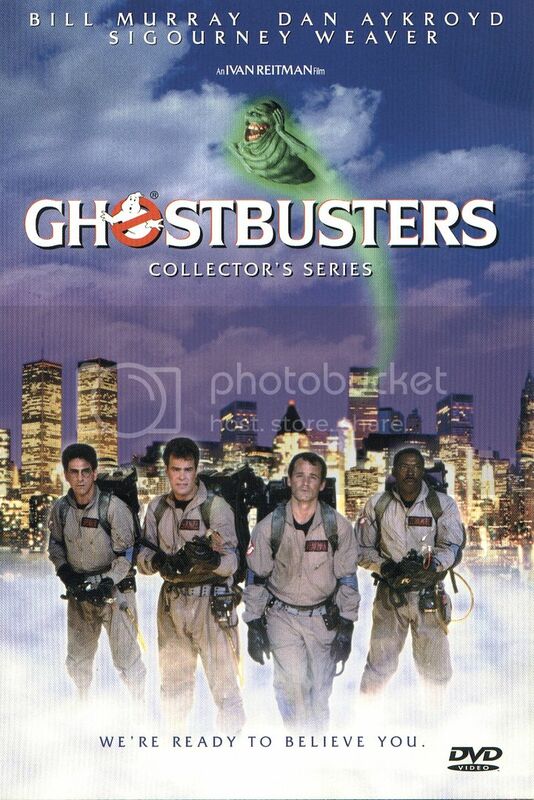 Without income, but with a renewed belief in the otherworldly apparitions which haunt Manhattan, they put a new mortgage on Ray's childhood home and decide to go in business as the Ghost Busters, paranormal exterminators. Business is slow at first, but when a posh apartment lady, Dana (Sigourney Weaver), starts getting harassed by her refrigerator - which, incidentally, opens onto another dimensions where ancient Sumerian demi-gods chant, ZOOOL!, into the steamy flames - business positively booms! And if demonic possession, floating grubby green things and 8000-year-old pissed off deities wasn't enough, the Ghostbusters eventually get harassed by the Environmental Protection Agency, as represented by the snide skeptic, Walter Peck (William Atherton). One of the funniest ghosts: we love when he starts idly making loops around the chandelier and going, "Vroooom. Vroooom." The reason we noticed this film's uncomfortable white-washing/colorblind racism/callitwhatyouwill, is because, when business really gets going, the Busters hire an additional member of the team: Jesus-loving, down-to-Earth guy, Winston (Ernie Hudson). And then we spend the rest of the move watching him get ignored - sometimes even, literally pushed aside! There were shots where the original three would have their conferences about what to do about Gozer the Gozerian, and Winston would just kinda be off to the side - we think Bill Murray was probably even blocking his line of sight! Then little, insidious things, like when the Busters have to cross their beams, and they each get a close-up shot of their face as they fire up - except, of course, for Winston, who is just shown in the end as being in the crossed beam group. So much for individuating him - out of a group of four, he becomes the only member who is truly amorphous, without distinction. It's really lame. WTF? Why is Ernie Hudson stuffed behind Bill Murray's power pack? We don't think it's real racism, but we do think it's colorblind prejudices which are playing out in the details. And it brings an otherwise perfect, awesome movie down a notch. Blah.